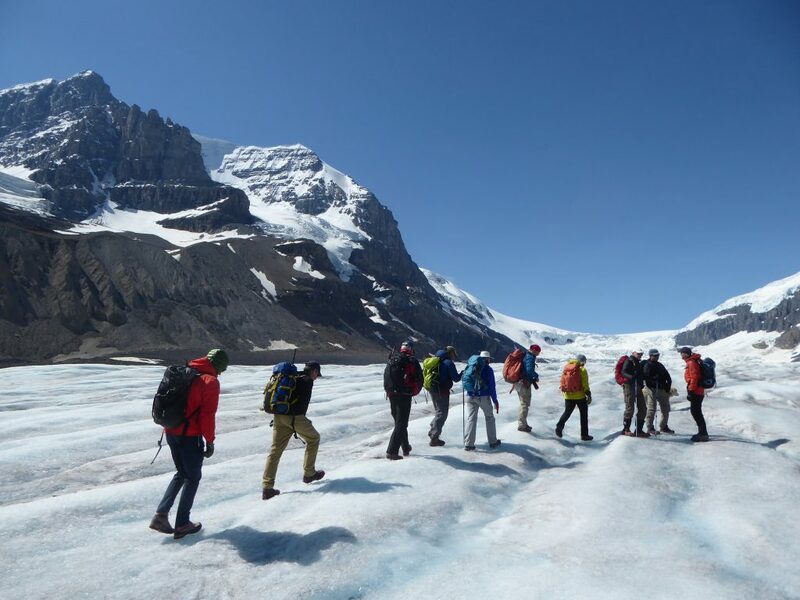 Midway between Lake Louise and Jasper is one of the wonders of the Canadian Rockies, the Athabasca Glacier. A literal river of ice, it flows down from the Columbia Icefield towards Highway #93, and is a must-see destination in the Canadian Rockies. Last week, on a field trip sponsored by our Interpretive Guides Association, I got to join Master Guide Peter Lemieux and fellow interpreters on an ice hike all the way up to the top of the glacier, where it tumbles off the Icefield in a series of ice falls. What a spectacular place, and what a unique experience! 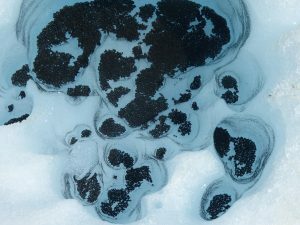 A pool of mysterious “cryoconite,” made of wind-blown dust and microbes. We passed millwells and crevasses, ice-scraped bedrock and sub-surface ice tunnels. Along the way there was so much to look at, from the mysterious “cryoconite” deposits on the surface of the glacier to the massive side moraines that showcase what a beast the Athabasca Glacier was in the 1800s. Peter and his dog George led us across the ice surface, chopping the occasional step, offering the occasional hand, and stopping to share stories of the changes he’s seen at the glacier over the 30+ years he’s been leading trips there. 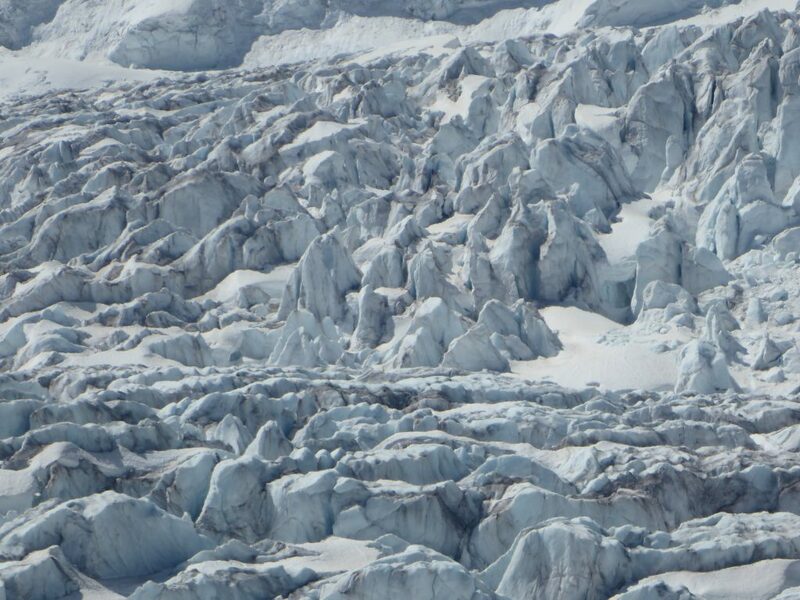 Most shocking is the speed at which the glacier is receding. Peter stopped at one of the metal research poles in the ice, where, at the end of May, he’d put a piece of yellow tape around the pole where it came out of the ice. 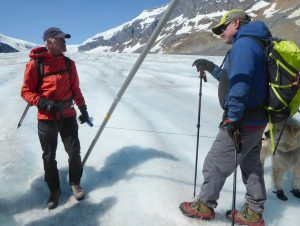 In less than a month, the ice surface was melting away quickly, and he said that the glacier will lose 5 – 8 metres of ice from its surface this summer. It was a powerful reminder of climate change in the Rockies. The piece of yellow tape by guide Peter’s hand was wrapped around this pole in late May, right at the surface of the ice. In less than a month, almost a metre of ice had already melted away. The highlight was getting to the icefall, where chunks of ice the size of houses cartwheel down from the icefield above. Previous PostCanada Day and July the 4th are for the Birds!